In the books I’ve got about Mt. Athos information about Mylopotamos is scarce. Even most of maps that were published in the past decades forgot to mention the existance of one the most beautifull spots on the peninsula. Between the monastery of Iviron and the Arsanas of Filotheou, you can find probably the finest spot of the Eastern Athos “Riviera”, with a broad fertile piece of land, probably build near a dyke with a mill. Mylopotamos is certainly a small river, where only in the rainy season water flows. The cell lies on a cape, on one of the most magical spots one can imagine. This was noticed long ago by mankind, because hundreds of years ago there has been a cult of Artemis Potamia (of the rivers) on this place. 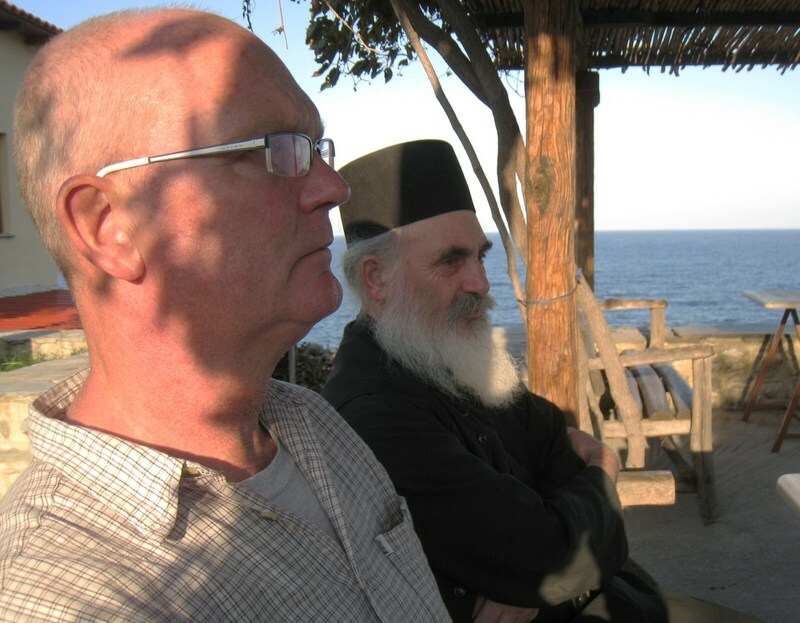 It is possible that the Artemisian cult has survived here for a long time, because there is a story that Athanasius personally has “purified”the surroundings. He preserved a marble relief of the goddess, that he did not destroy, and it has found its way as a “jewel-stone”in the wall. The cell, as well as the vineyards, was founded by Athanasius. The little church of the kellion is one of the oldest of Mt. Athos. Outside the wall, but equally very well protected – like the whole settlement -, there is a Konakion, a palace-like building, with a chapel of the Great martyr Eustasius Plakidas. The settlement is build as a rest house for monks of Lavra, who want to have time to relax. Between 1899 and 1901 the Patriarch from Constantinople Joachim III lived in Mylopotamos: he planned to spend his old days there. The traveler who passes by and finds a way to stay here for a while and who sees the beauty of this spot, will conclude that in early days the monks already knew where to find the finest of idyllic places in spite of all temptations in the world. It is said that Saint Athanasius, the founder of Lavra, also built the cell Mylopotamos in honor of the Martyr Eustatius and the first vineyards were planted here. 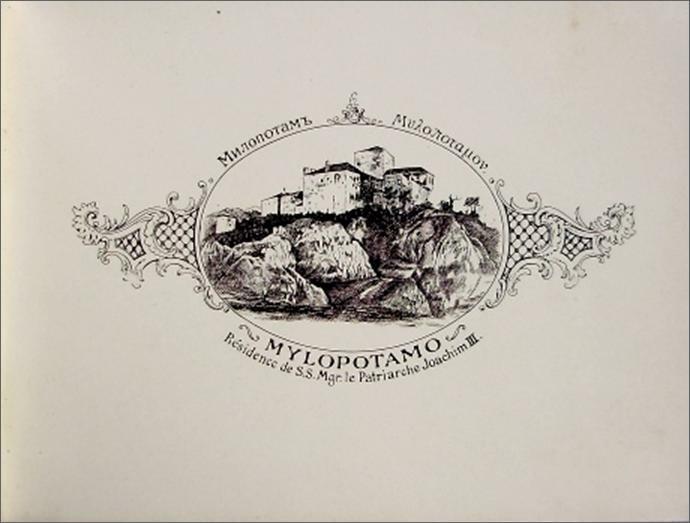 Mylopotamos was first mentioned in a letter from the Byzantine emperor Nikiforos in the year 1017, although the name spelled differently – Neilopotomou. A letter of the Great Assembly of the Holy Mountain (1635) defined and described the boundaries of the land of Neilopotamou and the Iviron monastery in the area. We do not know the size of the buildings nor the extent of the fortifications built by the saint. The fortress-like complex that survives today as a result of successive additions and repairs. However, the proximity to the sea and the fear of pirate raids – not rare in the 10th century -, required an adequate fortification. Systematic archaeological research will show whether the impressive tower of Mylopotamos, at least in its original form, very likely belongs to the time of St. Athanasius. In the years 1527/28 Mylopotamos is looted during the invasion of pirates. Soon after it was rebuilt by Theophilus according to a inscription on the tower. 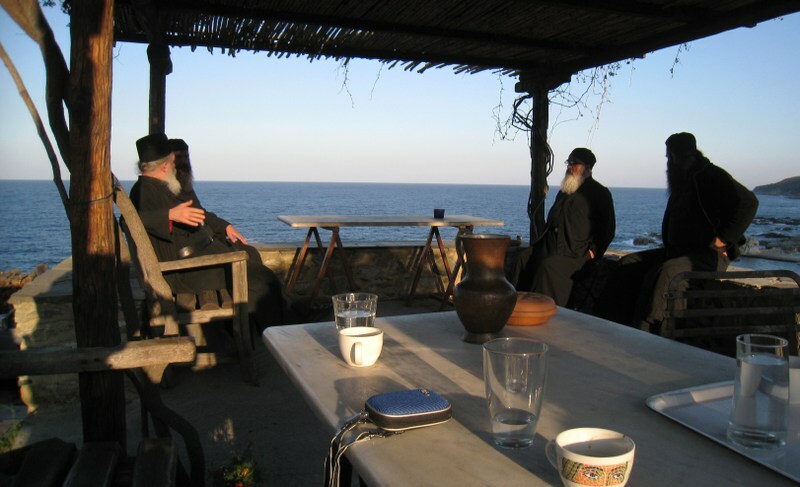 The period between 1889 and 1901, when the Ecumenical Patriarch Joachim lived in Mylopotamos, was the last prime period of Mylopotamos. Since then the place gradually declined. For a thousand years now Mylopotamos produces wine. 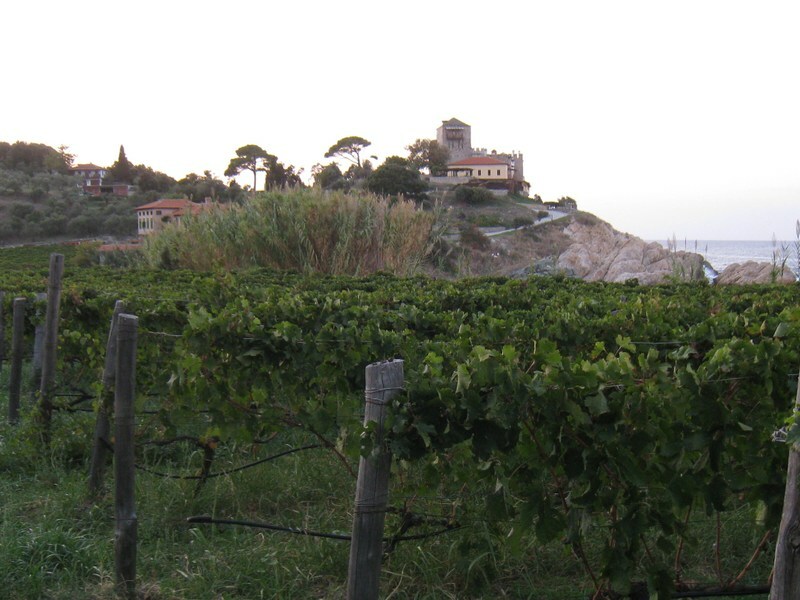 The production was interrupted after World War II, when the Phylloxera destroyed the vineyards. Substantial efforts were launched in 1990, consisting of a promising radical renovation of the complex (tower, church, housing). 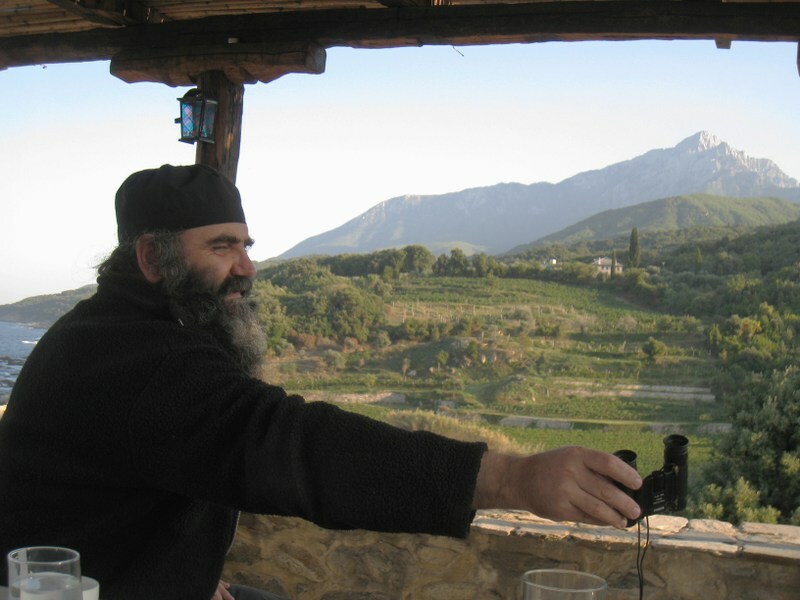 In 1992 Father Epifanios took over with care and great effort. 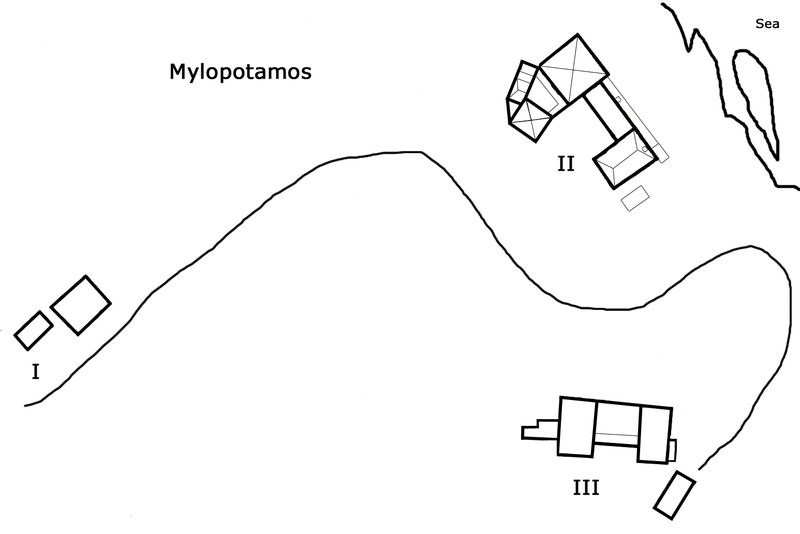 Mylopotamos, the terrace near the guesthouse (G on plan below). The gathered monks take some time to relax and enjoy the lush autumn evening. Next time more about the winery of Mylopotamos. This entry was posted in Mylopotamos, trip 2009: Herman's group, trip 2009: Wim's group and tagged Epifanios. Bookmark the permalink. 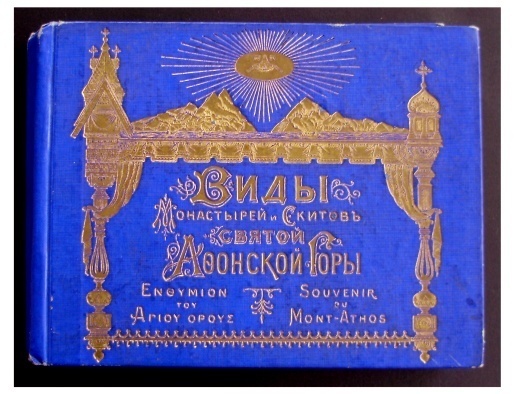 I plan to go to Mount Athos in March with 2 friends. 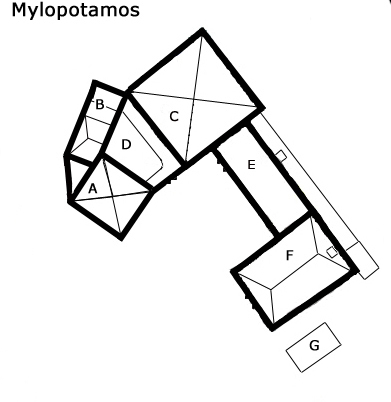 I wish we could stay for 1 night at Mylopotamos. How long is it to walk there from Karyes ? Do you know the fax number of Mylopotamos monks ? I just send an e-mail and made all nessesary arrangements. The walk from Karyes would take 2 or 3 hours.